Yuma Crossing National Heritage Area is a cultural crossroads offering visitors a diverse and intriguing history. The first National Heritage Area west of the Mississippi River covers 21-square miles encompassing the town of Yuma, Arizona, near the Californian and Mexican borders. The history emphasizes three major cultural groups — American Indian, Hispanic, and Anglo-American. The crossing point attracted many over the centuries because of the natural narrowing and calming of the Colorado River. Although bridges now span the river, it is still possible to view the granite outcroppings and significant historic buildings and sites throughout the heritage area. Yuma Crossing was an important transportation and communication gateway between New Spain and Alta California during the Spanish colonial period and between the American Southwest and California during the time of the American westward movement. As it is today, the Colorado River was the lifeblood of the entire region, yet the rushing water, so vital for life, made it nearly impossible to cross the river safely. Pre-contact American Indian tribes were the first to discover the natural granite outcroppings that settled the mighty Colorado River enough to make crossing feasible. Many peoples, including the ancestors of the modern day Quechan and Cocopah tribes, settled near the river. The first Europeans to arrive at the crossing were Spanish explorers led by Hernando de Alarcon and Melchior Diaz. 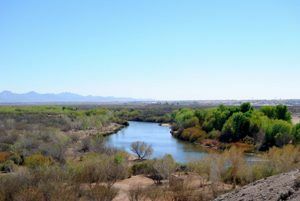 In 1540, the expeditions navigated up the Colorado River from the Sea of Cortez and found thriving communities along the riverbanks near the crossing. These Spanish explorers coined the name Yuma. Noticing how the Native Americans’ cooking fires filled the valley with smoke, the Spanish called the Indians the Yumas, stemming from the Spanish word for smoke, humo. After the first Spanish explorers came, others continued to travel the region. Father Eusebio Kino’s interest was in building missions and converting the native peoples to Christianity around the middle of the 17th century. Then in 1774, Juan Bautista de Anza traversed the crossing in search of a practical overland route from Mexico to northern California for New Spain. 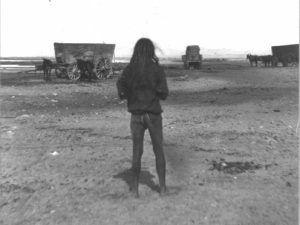 He arrived at Yuma in January and established friendly relations with the Quechan tribe, who controlled the crossing, allowing future Spanish settlers safe passage across the river. Anza’s trail and the Yuma crossing opened the route for further Spanish settlement in Alta (or upper) California. As use of the crossing increased, the Spanish felt it necessary to control the crossing, although this strained the Quechan relations leading to a rebellion in 1781. After the Quechan destroyed the Spanish settlement at the crossing, the Spanish never again tried to control the Quechan or the Yuma Crossing. The Mexican-American War of the late 1840s forced Mexico to cede most of what is now the American Southwest to the United States, although it was not until the ratification of the Gadsden Purchase in 1854 that the area south of the Gila River of Arizona, including Yuma, officially became part of the United States. The area became popular with Anglo-Americans during the Gold Rush of the mid 1800s. At the time named Colorado City, the town saw over 60,000 travelers in one year crossing the Colorado River by rope ferry in pursuit of California gold. With the increase in traffic, the U.S. Army took notice of the importance of the site and in 1852, established Fort Yuma on Indian Hill, overlooking the crossing. In the 1860s, the U.S. Army created the Quartermaster Depot to supply the new American Southwest outposts and shipped freight and supplies by sea and up the Colorado River by steamships to reach the depot. At any one time, the warehouse held a six-month supply of food, clothing, ammunition and other necessities for forts in Arizona, Nevada, Utah, New Mexico, and Texas. With the coming of the railroad in 1877, which eventually became part of Southern Pacific Railroad running coast to coast, the need for the Depot faded and the Army closed it in 1883. The site then served a variety of purposes, including housing the first office of the U.S. Reclamation Services, now the Bureau of Reclamation. 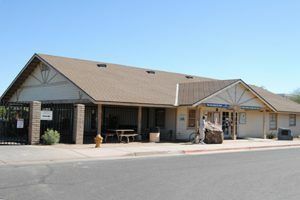 The U.S. Army Quartermaster Depot is listed in the National Register of Historic Places and is now the Yuma Quartermaster Depot State Historic Park displaying five of Arizona’s oldest and best-preserved buildings dating from the beginning of the Depot. Exhibits describe the amazing engineering feats of the Bureau of Reclamation’s irrigation project. As more people learned of Arizona City, renamed after a flood that destroyed Colorado City in 1862, the town grew becoming one of the busiest and wildest of the Wild West. After the Civil War, Main Street became a 100-foot right of way to accommodate the heavy wagon traffic. Officially incorporated in 1871 as Arizona City, the town had its name changed once again in 1873, this time to Yuma. 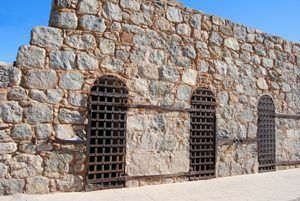 Shortly thereafter in 1876, the first prisoners chiseled the first seven cells for the infamous Yuma Territorial Prison out of the granite hillside. Yuma Territorial Prison operated until 1909 when overcrowding forced its closure, but soon after the prison closed the local high school burned and the old prison buildings provided classroom space for area students from 1910 to 1914. The 1920s rerouting of the railroad caused the destruction of half of the original prison. Distressed families and hobos took refuge in the abandoned buildings during the Great Depression. Local volunteers finally saved the prison from deteriorating by creating a city museum, which then became the main attraction of Yuma Territorial Prison State Historic Park. The park is open year round so visitors can experience the prison, which gained considerable fame after it was a feature in the 1957 film and more recent remake of 3:10 to Yuma. Like the Depot, the prison is part of the part of Yuma Crossing and Associated Sites National Historic Landmark. At the turn of the 20th century, Yuma’s focus changed from the Wild West to taming the wild Colorado River. The newly formed US Reclamation Services, now the Bureau of Reclamation, took on an irrigation project, called the Yuma Project. Construction of Laguna Dam, which is just 13 miles northeast of Yuma, began in 1905. A massive tunnel was also part of the project. The Yuma Siphon pulled water from the California side of the river into the town of Yuma. An exhibit in the Corral House of the Yuma Quartermaster Depot State Historic Park provides information about the construction of the Laguna Dam and Yuma Project. The Yuma National Heritage Area includes a number of districts and individual properties listed in the National Register of Historic Places. Yuma’s historic downtown, with its Yuma Main Street Historic District and Brinley Avenue Historic District, is an important center for the community. As gold rushers ran for the California hills, Main Street funneled thousands of travelers to the rope ferry crossing the Colorado River. Close proximity to the river caused many floods, sweeping away the town on more than one occasion. The last big flood occurred in 1916, so most of the buildings on Main Street date from the 1920s. Madison Avenue, included in the Brinley Avenue Historic District, was more sheltered from floods, so visitors can see buildings dating from the 1860s there. The buildings range from adobe residential buildings to commercial blocks. Just out of historic downtown is the Yuma Century Heights Conservancy Residential Historic District, the first suburban development in the area. Developed at the beginning of the 20th century, the neighborhood is an eclectic mix of Victorian architecture. During World War II, the Yuma area teemed with activity. Yuma Army Air Base opened and became one of the busiest flight schools in the nation. Once the war ended, development and growth moved out of the historic downtown, but in the last ten years, the community has been working hard to revitalize the downtown. Recently, Yuma opened the Pivot Point Interpretive Plaza, an outdoor exhibit area at the exact site where the first railroad entered Yuma in 1877. The exhibit area explains the historic importance of the natural crossing at Yuma. This park preserves the original concrete pivot on which the rail bridge would turn to allow boats to pass. The city is also striving to restore the riverfront. The East Wetlands, an area of 1,400 acres, has been set aside as a nature preserve. Confined by levees for flood control, a buildup of silt and non-native vegetation had clogged the riverbank. So far, the city has restored 400 acres to its natural habitat. A 3-mile hiking trail within the East Wetlands is now open. The West Wetlands is a 110-acre river front park the public can enjoy. The Quechan Indian tribe plays a pivotal role in the heritage area, particularly in relation to the Yuma East Wetlands restoration. Yuma Crossing National Heritage Area is a unit of the National Park System and a National Historic Landmark. It is located just off Interstate 8, halfway between San Diego, California and Phoenix, Arizona. Yuma Quartermasters Depot State Historic Park is located on North 4th Ave and has free admission. Yuma Territorial Prison State Historic Park is located at Giss Parkway and Prison Hill Rd. Pivot Point Interpretive Park is located where Madison Avenue meets the river. The East and West Wetlands, located near the Colorado River, also offer outdoor recreation activities. Compiled and edited by Kathy Weiser/Legends of America, updated April, 2017.